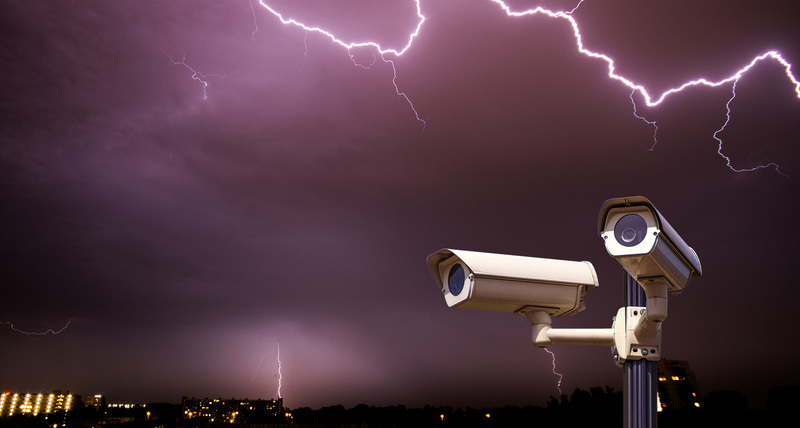 In real projects,APs and cameras are often installed outdoors or at an elevated location, which increases the chance of lightning strikes on cameras and PoE-powered switches. The result is that individual devices are damaged when the outcome is light, and even the whole local area network is damaged.Tenda TEG11 series switches have professional lightning protection design - 6KV Lightning Protection for Ports and the power,and they have two levels of protection design respectively, which effectively suppress the lightning current from the network cable and power supply, equivalent to adding a security wall to the entire network monitoring system. The test standard is much higher than the national CCCrequest. In the thunderstorm, Tenda TEG11 series switches can also provide a stable and reliable service to the surveillance network and guarantee the normal transmission of the picture. CCTV: in this mode, the port cache is optimized and PoE ports 1-8 have higher priorities over the other ports. 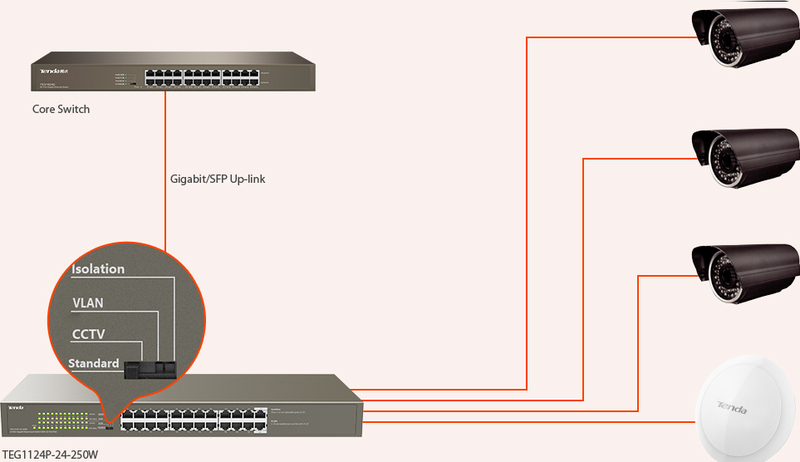 All the ports of the switch can communicate with each other.If multiple IP cameras are connected to the switch, you are recommended to enable this mode and connect the uplink port of the switch to the upstream device which the monitoring computer connects.This ensures smoother monitoring video playback. Standard: he switch functions as a common unmanaged switch and all the ports of the switch can communicate with each other. VLAN: ports 1 to 22 of TEG1124P-24-250W are isolated from each other, but can communicate with ports 23 and 24 (uplink ports) respectively.Solid DIP switch to isolate ports to prevent broadcast storm and defend DHCP spoofing. Isolation:ports 1 to 12 and Ports 13 to 24 of TEG1124P-24-250W belong to two different VLAN.This mode can be used to isolate supervision network and wireless network to make them not interfere with each other. Ports 1-24 comply with the IEEE802.3af and IEEE802.3at power supply standards. The entire switch offers a maximum PoE power output of 225W, whereas each port offers a maximum PoE power output of 30 W. The ports can be used to supply power to and exchange data with APs and IP cameras.